The 2018/19 Premier League kits just keep on rolling in. Acting as the perfect antidote for the ‘post World Cup blues’, the likes of Nike and adidas have been treating us to stunning new releases all week. Now that the dust has finally settled in Russia, it’s great to see that the new Premier League season is starting to take shape. And yes, we’re already completely hyped for it. 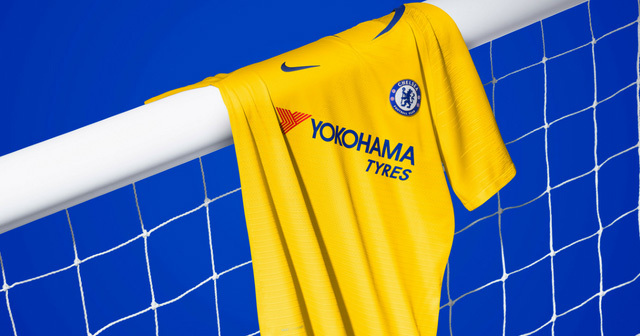 Following on from the release of their gorgeous new Tottenham kits, Nike have now started to create a buzz in a different part of London, as they’ve just dropped an absolutely dazzling Chelsea away kit. In case you hadn’t noticed, it’s extremely yellow. This summer sees the dawn of yet another brand-new era over at Stamford Bridge, following the departure of Antonio Conte and subsequent arrival of Maurizio Sarri. The former Napoli man is renowned for his attacking, flamboyant style of play, and you’ve got to say that these new football kits certainly fit in with that philosophy. 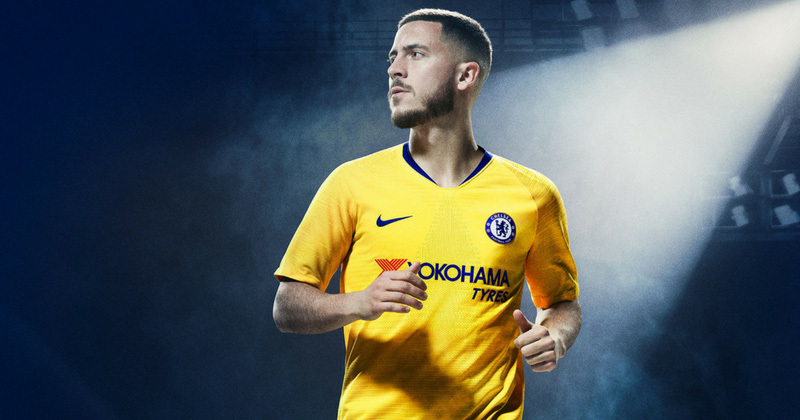 And it was all yellow: the 2018/19 Chelsea away kit. Image by Nike. Incorporating one of the boldest colourways you’re likely to see this season, this beautiful yellow number is brimming with confidence and sheer audacity. Coming complete with signature blue detailing and a subtle graphic on the sleeves, it’s fair to say that this daring football kit might just encourage the Chelsea players to express themselves a little more. But although the likes of Eden Hazard and Willian might be able to thrive in it, Nike have actually drawn on a different source of inspiration for the kit’s design. Of course, as with many of their other new Premier League kits, Nike are paying homage to the history of the club. Chelsea first wore yellow back in the 1963-64 season and, by the end of the 1970’s, these bold away strips had become almost synonymous with the London club. Each design came complete with the same blue shorts and detailing- apart from the 1978 kits, which looked more like a Norwich City home kit than anything else. The 2018/19 design follows similar themes, with blue detailing found on the back of the shirt, around the collar and within the logos and sponsors. Nike have done a fantastic job in celebrating the history of the club, and older fans are sure to be reminded of the yellow kits of the 1970-71 season- back when the Blues won the UEFA Cup Winners’ Cup. Now that they’re back in the Europa League, Chelsea will be hoping to replicate the achievements of that legendary side. The new Chelsea away strip was released on 20th July, and you can compare prices at FOOTY.COM to find the cheapest football kits on the internet. The only question is- will Eden Hazard be wearing this kit come August?